The food you eat provides your body with glucose, a form of sugar that your blood stream carries to various cells of your body. Glucose is your main source of energy. Your body uses insulin to enable the glucose to enter your body’s tissues, where your cells turn the glucose into energy. If your body is unable to produce insulin, or if the cells of your body don't respond to insulin properly, glucose starts to build up in your bloodstream and becomes a condition known as hyperglycemia. One of the tests doctors use is called the glycated hemoglobin test, also known as the A1c test, to determine what percentage of blood sugar is attached to your hemoglobin. The higher your blood sugar, the more of your hemoglobin has glucose attached to it. If your blood sugar level is below 5.7 percent, your blood sugar is normal. 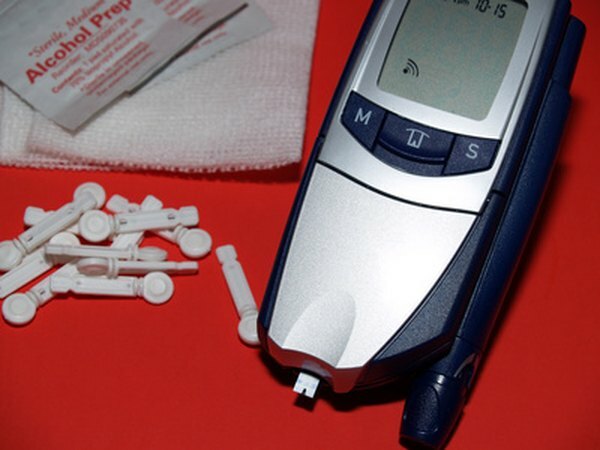 If your blood sugar level is between 5.7 percent and 6.4 percent, there is a fair chance that you might have pre-diabetes. If you get a result of 6.5 percent or higher on two separate tests, you might be suffering from diabetes. If you find that you have hyperglycemia, you need to take steps to have it treated as soon as possible. Left untreated, hyperglycemia can lead to a condition called ketoacidosis, more commonly known as a diabetic coma. Your body cannot use glucose for fuel without insulin and instead resorts to breaking down fats for energy. When this happens, ketones, or waste products, are produced. Unfortunately, your body will not be able to flush out all the ketones, and they will build up, possibly leading to ketoacidosis, a life-threatening condition. If you notice symptoms such as a very dry mouth, nausea and vomiting, shortness of breath or breath that smells fruity, seek medical attention immediately. Making wise food choices helps reduce your blood sugar and is the foundation of hyperglycemia control. Limit sweets eat healthy food often. Be aware of how many carbohydrates you eat and how often. Increase your intake of whole-grain foods, fruits and vegetables. Eat less fat and limit your use of alcohol. Keeping your blood sugar from going up requires you to make a few changes in your lifestyle. Aside from making careful choices about what you eat, you also need to work with your health care provider to formulate a plan to control your weight, get the amount of exercise you need and improve the quality of your sleep. If you are overweight, aim for losing a pound a week and make sure your exercise routine includes both aerobic and strength building elements, as both help improve insulin sensitivity. Getting sleep regularly is also important, as inadequate sleep may impair insulin sensitivity and increases the risk of obesity.